Throwback Thursday Video and Before & After Pictures! For Throwback Thursday, check out this never-released video of The Johnson Strings at the James J Hill House Mansion singing "Life is Hard"! Did you know? This beautiful mansion was once used as a convent, and NUNS used to roller skate on the marble floors in the basement! Also, check out the fire-breathing dragon gas lamps, the green leather wallpaper, the carved woodwork, and the gold leaf ceiling! Pretty cool! Be sure to like it and share it with your friends! Many people have been asking about our gorgeous little theater that we remodeled before opening our show in June of 2017, so here are a few before, during, and after pictures! We started the renovation process in March of 2017 and then worked SUPER hard, super LONG days to get everything finished in time for our opening on June 8th, 2017! In the picture below, you can see the progress… we went from a white ceiling, brown walls with white spider-webbing on them, ripply carpet, ugly lighting, curtains instead of doors in 4 areas, and a kitchen badly in need of an update, to the beautiful space we have now! Here you can see progress on the painting job, a wall taken out to free up space, and the start of the new doors being put in! 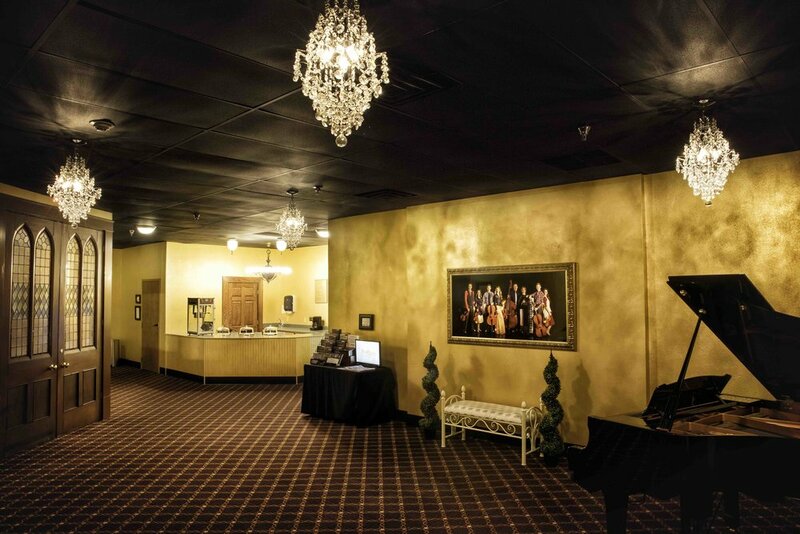 Gold walls, black ceilings, chandeliers, a cute little kitchen, re-stretched carpet, new baseboards and trim, and a baby grand player piano certainly make our theater very inviting! 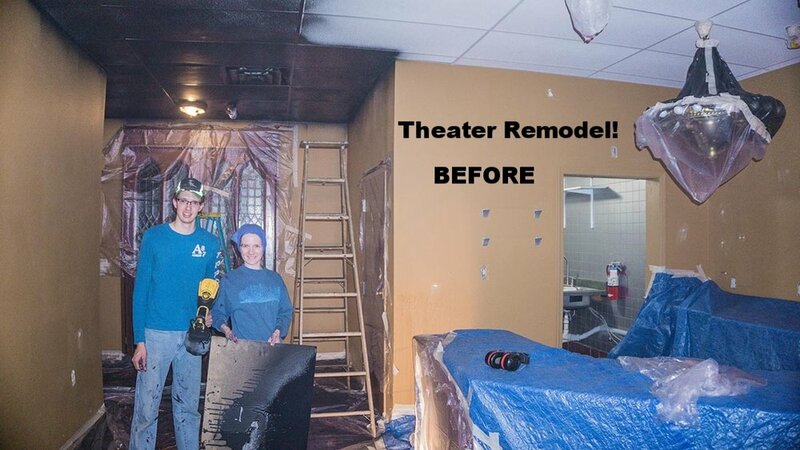 And of course, here is the renovated theater itself, complete with Luke’s beautiful new stage lighting! One thing we enjoy when we are not working at the theater is playing family games while eating dark chocolate and drinking tea! Do we have any Settlers of Catan Cities and Knights fans out there? We've got a show tonight, so I better sign off for now! Uh oh. What would you do if your movie shoot outfit did not show up in the mail as promised? And you had no notice in advance? And it needs to be a dress in a very specific style and color of red? It is not a good feeling. But at least you would still have until midnight to do something about it, right? So, after my visit to Weddings at the Homestead, I start the search, eventually heading to Springfield to find a dress that matched the look and style we were creating. The dress alterations were finally finished after midnight, and we all got a few hours sleep before loading up and driving over to the video location. Who needs much sleep when you are running on adrenaline while filming the next day? The big FALL: Many of you know that our brother Luke had several major surgeries last year on his ribs. In the movie, Luke jumps off a hay bale with a stunt violin and lands close to the camera. The only problem was that when he jumped off, he landed TOO close to the camera! In order to miss smashing it, Luke went flying and everyone’s heart stopped!!! I have never been so close to such an impressive fall! Thankfully, Luke was totally fine and the violin did not even have a scratch! On the bad side, his clothes were a MESS and we still had half of the movie to film! Abigail to the rescue! Under her capable hands, many mud and grass stains magically disappeared off of his suit coat and WHITE pants. Betcha can’t even tell! Luke even rigged up a way to wire his broken button back onto his suit coat! After a long day of filming, what would you do? How about celebrating with ice cream, of course! Now when you head over to watch “Yankee Doodle”, keep an eye out for the outdoor fireplace and chimney. It used to be owned by the original Sheriff of Branson - a baldknobber! How cool is that? Also, if my memory serves me correctly, the old cabin, circa 1888, used to be a two room cabin that housed 14 children! Talk about a lack of personal space! And for the guys out there, I would be remiss if I did not mention the 1950s Chevy 2 ton flatbed truck - it is a beauty! With that, I better sign off for now. Keep your eyes peeled for the next update and hopefully we will see you soon!